It’s been a long time since Emile and I have been able to make decisions based on what we want to do instead of making the best of a situation that we are in. With unemployment and financial considerations, we made do. We dealt with what we had and were okay with that. I think “because I want to” decisions are scary than “because I had to” ones. June 27th, 2013 Extra-Ordinary: Extended our lease until March 2015 because we want to. A gorgeous day and a forecast of more to come. I awoke determined to find both more items to throw out of my warehouse AND to get outside to run run run. I did the first while I waited for my running partner to get out of bed and get ready. Emile is good at being on time and reliable, but given a fluid schedule, he is the best futzer I have ever met. He could stretch anything into a 4 hour event. But nonetheless we finally got out of the house. I should mention here that I changed my rules for my running month of May. I am not going to run every day – honestly Self! You are a Materials Manager you are busy – but instead run a cumulative amount for the month. This seems more realistic as I can definitely spend more time on weekends exercising then I can on my 12 hour days spent commuting and working. So, my goal for the month is 130 kms. But back to Saturday. What a Day! Sunny. No Humidity. 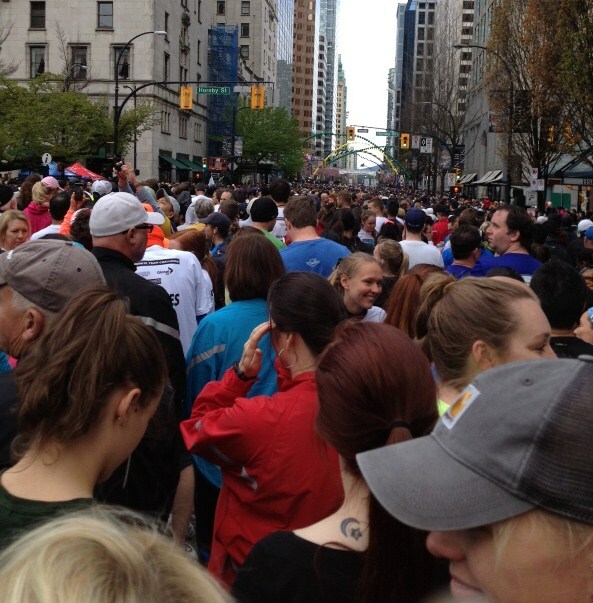 Okay – that actually was a picture of my view at the Vancouver Sun Run, but you get my meaning. There were a whole bunch of people pouring of off the cruise ship and everyone was out enjoying the weather. It made it feel like a race picking your way around people. But I got in 9.2 kms. Okay – that is another lie. I am a liar. I cannot claim 9.2 kms today. My shins. My poor poor shins. They hate me after pushing through the Sun Run and having recovered yet. So, I probably ran about 6. or 7 and then had to walk – at a lively pace – but walk nonetheless for the rest of the day. There comes a point that pushing yourself is stupid if it is going to result in injury or longer lasting pain. But it was such a beautiful day that we decided to register for the BMO marathon on May 5th. Because we could. Because we were right there. Okay – that is another lie. God – what is wrong with me?! There was never any intention of signing up for the marathon or the 1/2 marathon. Instead, we were going to do the 8k, but for some crazy reason whoever was in charge of the race – and it must not have been a sane person – scheduled it to start at 6:30 am. Wha?! The only thing I do at 6:30 is get out of bed into a hot shower. So sorry BMO – and all the charities that you fundraise for – forget it. I am keeping my shins in bed along with my 50 bucks. Because I always sleep with my shins and 50 bucks. Always. But – the best part about not signing up for the BMO marathon was enjoying the “Expo” and getting free things like health bar samples, yogurt, weird BMO gloves that look like those gloves you buy for exfoliation in the shower rather than real gloves. I must say the Vega booth was pretty cheap on their samples though – you had to go up and request that they cut a little piece of a bar or give a little sip of a drink. If you are giving free samples – then don’t be cheap about it. That’s what I say! Put them out there – share your stuff. Don’t make them beg for it! Any hoo, back home where somehow it was already 4:45 pm (I blame Emile with his futzing not my walking) to shower and eat healthy things like kale. Another LIE! I am out of control! Instead, we used my hidden credit card and coupon to buy $2 sweet fries at A&W and since we were there you can’t not have a diet root beer or apple turnover while sitting in the sunshine. (not that I have a hidden credit card normally, it was just tucked away in my running shorts). So, off we ran to see “The Manor” all the way across downtown as part of the Doxa film festival. It was good – but I found it hard to watch sometimes as I wonder how the director was able to show his family warts and all. (including his own warts). The filmmaker was there, and we joined in a lively discussion after the movie to learn more of his story, and went for drinks with the producers after the show. Okay. Yep. That too is a lie. We left immediately afterwards – alone – and headed to Chill Winston’s (best location in Gastown), sat outside, had a beer and wine and shared a pizza and watched the world go by. And that is no lie. May 4th, 2013 Extra-Ordinary: The best day of my life! Okay. No. Really, what I mean, is there are no regrets moving to Vancouver today. And Oh! That heat lamp at Chill Winston’s was pretty freaking awesome with the sun setting and the temperature dropping. And the wine was excellent.